Captain's Canal Park - beautiful property, great amenities. Very spacious and comfortable. Great location right in Canal Park within walking distance to many restaurants, shops, Lake Superior, and the lake walk. Parking was somewhat difficult - especially if arriving late afternoon and especially for more than one car. 10am check-out time is a little too early. We had a wonderful stay at Superior Reflections 1. The shoreline was unbeatable and was perfect for our young children. The cabin was very clean and well kept. It was a very peaceful location. Thank you! Very pleasant experience. Everyone had a good time. It was nice to have coffee with my daughter by the shore in the morning and being able to be together in the morning planning our day. Spending evening talking about what we had seen and did. Lasting memories of what my daughter consider one of the best family vacations ever. This was a perfect vacation home. 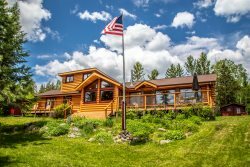 My advice to any visitors to the north woods is to rent this place! Seacliff was a beautiful home!! It was clean, spacious and had all we needed to truly enjoy our week!! We especially loved the view of the lake and being by the water every day!! The location was perfect. The place was very comfortable and clean. It had everything we needed. I loved the big window in the living room that looked out onto the lake. It was amazing! What a view! The home was very clean and had all the admenites you needed. The manager Don greeted us at our car as we drove up! What a nice man, he also checked in with us throughout our stay to make everything was okay. The home was beautiful, and the photos online do not do it justice. There was ample space for our family inside and out. This is a great home to get away from the hustle and bustle of everyday life. I really enjoyed the fact that there was little to no cellular service so our family was forced to have quality time without phones/internet. My family and I loved The Phoenix House. It's a great beautiful cozy home that anyone can actually enjoy and and have great relaxing time. It literally has everything we needed and we loved all the amenities such all the movies, books, games etc...We loved the decorations and every spot of the house. Best of all, it's located only a few minutes walking from Lake Superior and a few minutes driving from convenient stores. We would definitely go back! Having made a last minute trip we were pleasantly surprised by how fantastic this condo was. The pictures do not do it justice. It was well located, the beach area was private, the condo was clean and had everything necessary. Easy drive to Grand Marais but all the kids wanted to do was climb rocks and skip stones! My only recommendation would be for a comfy chair in the room with a view of the water. Our unit was fantastic. I was amazed how outfitted the kitchen was. We have stayed places that sleep ten but the kitchen is only outfitted for 6. Everything was clean and comfortable. The only thing I would change is the check out time. 10:00 is early.